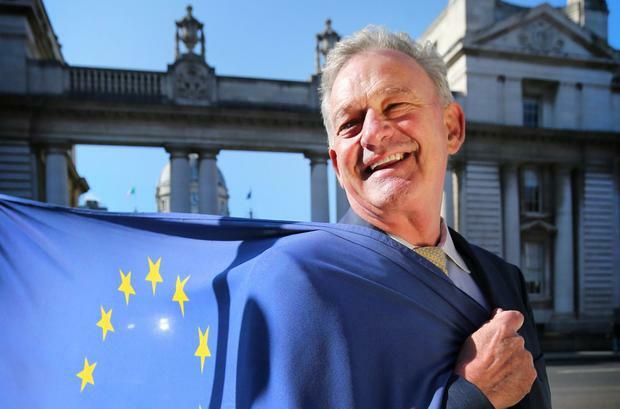 Love him or hate him, Peter Casey is back. The ‘Dragon’s Den’ businessman who lit a fire under the presidential election now wants to take on Europe. And while the news will have many burying their heads in the hands, he has a very good chance of getting elected. Casey is joining the field in the nonsensical constituency of ‘Midlands-North West’ which stretches from Kildare to Galway and up to Donegal. Voters’ issues will range from commuter traffic to rural isolation. The area spans 13 counties where Casey picked up more than 120,000 votes on his way to finishing second to Michael D Higgins last October. In 2014, the quota in Midlands North West was 129,290 – but that included the counties of Laois and Offaly which have now moved to Ireland South. Naturally the presidential election was a moment in time and Casey can’t bank on collecting all those votes again. However, it’s worth remembering he started the Áras campaign as the complete outsider, whereas now he is a household name. There is one empty seat in the constituency after the decision of three-term Independent MEP Marian Harkin not to seek re-election. Fianna Fáil top brass have been eyeing up her seat for some time, having made a complete mess of their electoral strategy five years ago. Their card consists of two sitting TDs, Brendan Smith and Anne Rabbitte. They will not be overjoyed by the prospect of fighting Casey who attracted strong Fianna Fáil vote in the presidential election. Casey could also pull votes from contrarian Luke ‘Ming’ Flanagan, who topped the EU poll last time. Sitting MEPs Mairead McGuinness (FG) and Matt Carty (SF) look safe. The odds would put Casey at the top of the list of newcomers who at this stage include Maria Walsh (FG), Dominic Hannigan (Labour), Saoirse McHugh (Green), Cyril Brennan (PBP) and Michael O’Dowd (Renua). Casey won’t win if he simply plays the Traveller card again. The European campaign will be very different – and his manifesto suggests he understands that. He is set to focus heavily on the rural-urban divide. “The Government must stop promoting Dublin as the centre of the universe, which only drives up the price of Dublin real estate and encourages more people to leave and ignore rural Ireland. If they pump any more jobs into Dublin, it’s going to fall into the Irish Sea,” he says. It’s a message that will travel well in the Border region and west of the country. He also argues companies who set up in rural Ireland should be tax free for the first two years and capital gains tax free if they sell the business within 15 years. That’s a goal that might be better pursued on the floor of the Dáil than in the bustle of Brussels. The country’s newest political party, Aontú, has spent its early days denying its an anti-immigration party. But much in the same way he was outspoken on Travellers, Casey has no qualms about delving into the issue of immigration. His manifesto includes a section which describes direct provision centres as “cramped bordering on inhumane accommodation”. He says a discussion needs to be had. Well, there are 43 days until polling.